Read more at Raleigh Commuters blog, from where I stole this photo. That’s one opinion, Christian. I ride a similar bike–a fixed-gear SE Lager with bullhorn handlebars–and I love it. Too, this Raleigh reminds me of the Redline 925 single speed (which I saw someone riding down Commonwealth Ave in Boston recently). Other than the dropdowns, it’s outfitted similarly. There are many different preferences for position on commuter bikes. I personally find the upright position uncomfortable and really dislike flat handlebars for there lack of variety in hand positions. To me, this bike is just what I am looking for in a commuter. It just needs a rack, bags, lights and bottle cages. Cada uno a su gusto. If it’s anything like my Lager, Miguel, I’d recommend it. I think it’s got a flip-flop hub in the back, and I’d recommend fixie–lots of fun. I ride my 925 in slacks all the time, there’s no need for me to be completely upright. Christian: the One Way is definitely not a racing bike, and drop bars don’t mean “hunched over,” it just means more hand positions. Ivan has his bars lower than his seat, but on my One Way the bars and seat are at the same level. There’s nothing to stop you from raising the bars even higher if you want. And last I checked, Basso’s home country of Italy makes him a European. The photo also doesn’t show him in any cycling clothes. I love my One Way too… but I loved it even more after I ditched the boat anchor tires (heaviest tire I have ever seen in that width), with some 28c GatorSkins. Unfortunately, I also had to get some narrower fenders because the stock ones act like a sail with 28c tires on there. Sympathizing with Christian, except that people don’t **need** a European commuting bike… but… where do I put my anything that I’m carrying? Where are the lights? Forget chain guard. And no turn signals, either 😉 – And I bet it comes at a dear price. Not necessarily hunched over, but I’m also not a dropped-bar girl. It’s got lots of positions – but none of ’em comfortable as my hybrids… but that’s a personal preference thing. City riding, perhaps… commuter? Not quite. Consider the distance. I like the uprights for the easy ride to the grocery around the corner, but give me the drops for my 12 mile forty-five minute commute. Drops are perfectly good on commuters if that is what you prefer. I happen to prefer ‘flared’ drops, especially with my hilly 10-mile commute. Im sure after decades in the drops, Basso feels most comfortable there as well. To voice another opinion on the whole upright versus aggressive geometry bicycles: I rode a very upright bike, got around, and it was okay. I rode aggressively for what that bicycle was capable of, but I didn’t like riding in traffic or dealing with rain and wind. Then I got a road bike, which I ride mostly in the drops, and that all changed. Having a bicycle with the option of an aggressive position gives you a whole slew of available options. I can sprint and keep up with traffic in the city, including from a full and proper stop, dodge potholes, hop, lose traction and recover with my low center of gravity. On a MUP I almost never get passed. It’s a personal preference, sure, but if one has any real desire to go fast (18 – 22 mph cruising speed), a low, aggressive geometry is wonderful for city riding. Plus good mess bags distribute the weight in a way that is compatible with the hunched over position, not the more upright one. Bike is fantastic. There are a few great, new bikes from Raleigh but it’s virtually impossible to find a dealer that has any in their store in So Cal. It’s all about the usual brands and carbon this and massive suspension downhill that. It is a very nice bike. Has a nice vintage look. Looks like something cyclocross bike from many years ago. I however wouldn’t survive a Canadian winter riding in those clothes:-). So while you are taking the bus in winter or are cleaning your bike in summer, I’ll take my Dutch bike for a ride to the supermarket. Riding upright helps me to watch traffic better and makes me more visible, instead of weaving through downtown traffic like a madman pretending to be a courier. A bike downtown is a means of transportation not a mode of exercise. (And you are just a few seconds faster if you ride like crazy). Ride safe and civilized, don’t give people a reason to complain about cyclists. I would like to ride fixie once, but there is probably a reason why you only see them outside in summer. I’ve bought a Raleigh One Way in 2008 and I’ve been riding it very happily ever since. It looked identical to the one in the photo when I bought it. I put 5-6000 commuting miles on it in Chicago each year and it’s held up well. I put a bigger chainring on the front (48), and I have a second wheel set with studded tires for the snow and ice. 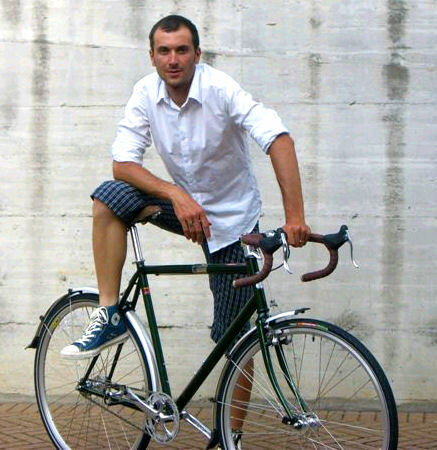 I love that Basso rode one, or at least posed with one. It goes fast enough when it needs to, especially with my summer tires (25s). And it’s solid enough for the snow and for hauling my computer and clothes in panniers. I had it set up the same as my road bike, which only gets a couple of thousand miles a year. So the Raleigh is my main bike.